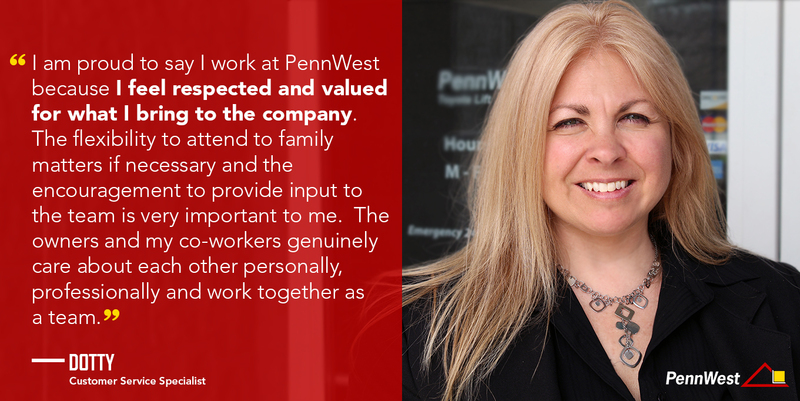 At PennWest, our people are the backbone of our success! 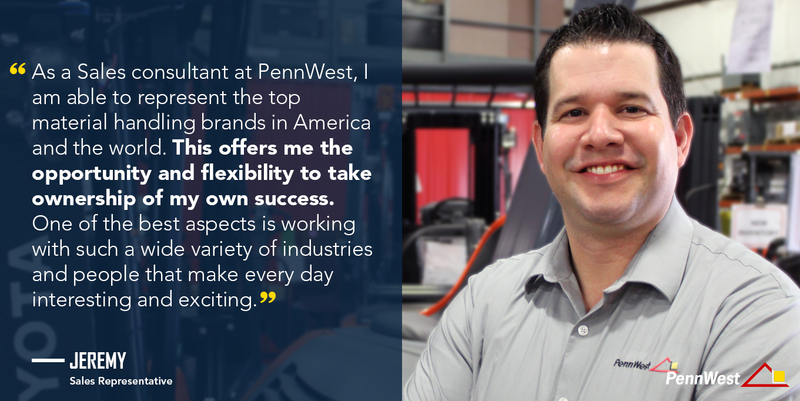 At PennWest Industrial Equipment, our people are the backbone of our success. Above all, they are knowledgeable, dedicated, customer focused and high-achieving. If this sounds like you, then you should consider joining our team! PennWest Industrial Equipment is a privately owned, leading provider of material handling solutions head-quartered in Mt.Pleasant, PA, just a few miles east of Pittsburgh, PA. In addition, we have branches in Erie, PA, Tarentum, PA and Fairmont, WV. We are the exclusive Toyota and Linde dealer for the Western Pennsylvania territory which includes parts of West Virginia and Ohio. 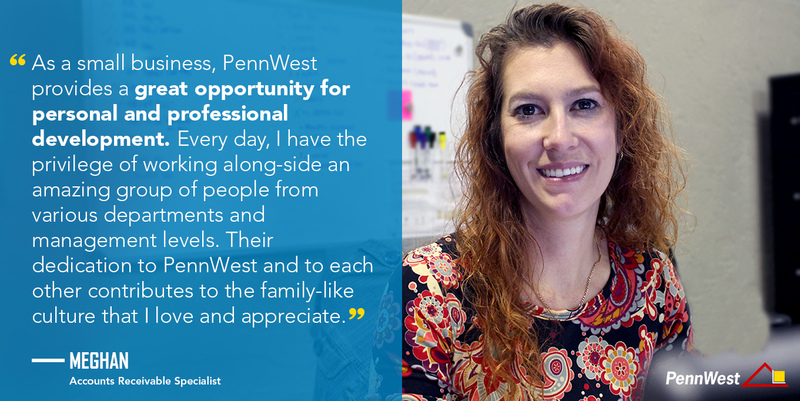 PennWest offers great benefits, for instance, competitive pay, excellent health, vision, and dental coverage, and paid vacation and holidays. To apply, please email your resume to Jennifer Hood, Human Resources Manager. PennWest is a premier provider of material handling & construction equipment & services in western Pennsylvania & Northern West Virginia. We have an upcoming opening for a Sales Coordinator, reporting directly to our VP of Sales, at our Mt. Pleasant, PA 15666 location (minutes from New Stanton and Greensburg). The Sales Coordinator assists the Sales Staff with internal responsibilities; purchasing, preparing quotes, maintaining sales data, tracking orders, preparing invoices, etc. Previous experience in an industrial environment a plus! PennWest is a premier provider of material handling & construction equipment & services in western Pennsylvania & Northern West Virginia. We have an upcoming opening for a Fleet, Facilities, and Inventory Manager, reporting directly to our Director of Operations, at our Mt. Pleasant, PA 15666 location (minutes from New Stanton and Greensburg). The Fleet, Facilities, and Inventory Manager is responsible for our 40+ Vehicle Fleet, the maintenance and improvement of our 3 Facilities, and our Service Van and Warehouse Inventory Management. ASEC or 5S experience a plus! PennWest is a premier provider of material handling & construction equipment & services in western Pennsylvania & Northern West Virginia. We are rapidly growing and looking for Sales Reps with a minimum of 3 years experience with proven success in the material handling industry. The Experienced Sales Representative will expand the customer base in Allegheny County, PA. Prior experience and knowledge of the top manufacturers in the field and familiarity with the product lines to initiate new sales opportunities via cold calling, inbound leads, social selling, and developing marketing strategies. Previous experience in industrial environment a plus!